there would never be a new harvest. when we cast them into the fertile ground of humanity. a wave of pleasure washes through me. Moon’s Crossing, Pemberton, a place where nature flourishes. Here the winter creek flows and sings over the rocks. I flourish here too, the smells, sounds, sights, sensations and feelings that arise here are all part of my living. One of the earliest thoughts about flourishing came from the great philosopher Aristotle, he thought that flourishing was the highest good of human endeavours, and that flourishing was the aim of all our actions. Somewhere that got derailed. Just as the Greek culture showed potential to pursue its own thinking, the Romans happened with their civic culture focussed on empire. And, as they do, empires come and go, not unlike plagues. Happiness became the human endeavour, a purely hedonic pursuit according to Martin Seligman. Seligman prefers to talk about Authentic Happiness and he has pinned his career on Positive Psychology, and its ideal of human flourishing. Seligman based flourishing on “Perma” which is:- positive emotion (happiness, pleasure, gratitude, joy), engagement (a state of flow), relationships (feelings of support, familiarity and security), meaning (belonging to and serving something other than self) and accomplishment (having goals no matter the size). In the mid 70s David Holmgren and Bill Mollinson developed permaculture, a relations or ecology system of farming and gardening. Permaculture’s three main principles are:- care for the earth, care for the people, setting limits to populations and consumption. Permaculture is more wholisitc whereas Aristotle was focussed on the benefit to the community, and Seligman’s Perma is focussed on psychology, but the three work together, they are not mutually exclusive. For me flourishing is having a personal ecology that consists of mutually suportive relationships, a positive relationship with nature, a spirituality, creative expression, learning, and reflection. These are the things that sustain me, give me pleasure and enable me to flourish and be creative. This is my manifesto, my mantra if you like, it has taken some time to learn the health of it, but it is a gift of life for me now. I find this image a powerful juxtaposition, and clearly this was the intention, and full credit to the artist who constructed it because it really sends a message. The date in the URL indicates that this artistic comment was prior to, and part of, the European change forcing supermarkets to donate their superceded fresh food to charities working with the homeless and destitute. The Guardian 5.2.2016 reported that the French government had legislated to make supermarkets give unsold food to charities for redistribution, instead of destroying it or dumping it. According to the Guardian, at that point French had been wasting 7 million tonnes of food annually. In the UK Tesco, according to the Daily Mail, June 4, 2015, voluntarily has offered to give food to charities as part of a waste cutting process. And into 2018, it is the food charities in Australia that are being proactive in pursuing the supermarkets to donate to groups like Foodbank. and similar work is being done in the US and elsewhere. In some countries there has been a clever utilization of technology whereby there are apps to help groups, individuals and companies to strategically donate. It is a win-win. 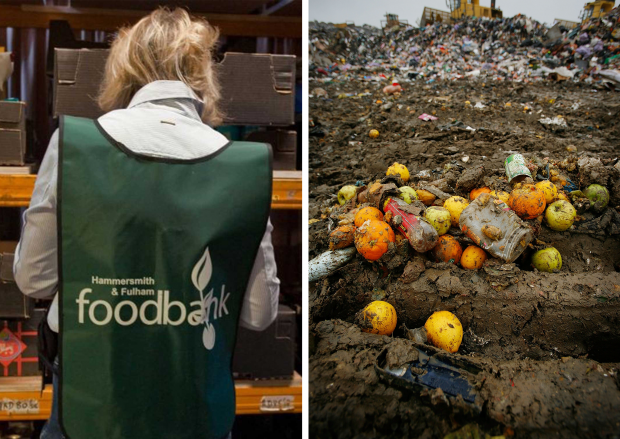 The supermarkets can sign off on community charity work, the supermarkets can deal with waste as an issue, the charities are now receiving the help they’ve only ever dreamed about, and the people in desperate need are receiving help. The only note of sadness is that it has taken a crisis of waste to shame the govenrments and supermarkets into action. But at least they’ve now taken action. And to think that most of it (though not all, because in some countries it was utilized in farming) was destined for landfill. It’s not new, but it is a renewal of an older idea that has returned out of necessity. I’m really taken with this new found advocacy that has sought to influence how community works and how commercial interests behave. What excites me most is that it has been a grass roots process to get the supermarkets and governments to cooperate in such a venture. It tells me that people power is still a legitimate force, that there is a conscience in many places across the world, that ordinary people can influence poltical and commercial process, and that we can be creative in response to needs. It gives me hope that we are not giving up, that we can tackle the big issues and make headway. It also tells me that we can do more. If we can influence food policy, surely we can tackle even bigger issues, like dealing with developing world debt, disease, poverty, homelessness, refugees, and even war. Food is not all that we waste. We waste time, money and ability. There has been, in Australia, a diminishing of volunteering, there has been a lack of commitment to helping those charitees working with refugees, the homeless, and those in poverty. But if we can change food policy, surely we can change other avenues of social and economic need. To me there is more to be done at the point of cause. why is there wasted food in supermarkets? So, it’s about tackling the big questions of how we can effect change in society, especially for the most vulnerable. And when you lose heart because change seems impossible, such achievements as this give hope for the long haul, that, in fact, change is achieveable, it only takes, energy, passion, time and effort on our part. Let’s not waste our time! Run, hide, stay in bed. They’re going to get you! The video is a traler for the Sean Penn doco – it is confronting because it challenges us to look at what we use and how it effects us. Toxicity is actually part of our lives, we can deal with it easily if we learn and take steps to minimise the effects of chemicals in our lives. But we do need to take stock of the things that do effect us. Do you love that new car smell? Beware. My first conscious moment of how chemicals affect could affect me was in the 1970s when I was sitting in my father’s car. It was a hot day, around 35c. The windows were up, there was no sea breeze at that point, and all I could smell was vinyl. I immediately wound the window down to allow air to come in and displace what I could smell. I didn’t know then that the sweet smell in my nostrils was vinyl chloride which is highly toxic. In the 80s I commented to a car repair guy that the windshield of my car often had a film on it, he said it was vinyl vappour. It wasn’t until the late 90s that some public comment was made to the effect of always leave your car window down just a little to vent the vinyl vapour. Vinyl chloride was developed in 1863, and over the next sixty years it would be refined and used in a number of applications from aerosols, to car fabrics. It was in production in the 1930s and was already the subject of research by those concerned for health. One of the research statistics was a consistent record of liver and kidney cancers among those who worked with the product. Since then the companies using poly vinyl chloride or PVC* have developed a more stable formulation, or, in some cases, companies buying in the product have reduced their usage. The year our two young sons wanted their bedrooms painted in bold and trendy colours, I set to and did it myself, never once thinking to move the youngest’s aquarium tank out while I painted. I used a new formulation of paint on the market, made by a top brand. I thought the fumes were extreme. The next morning the fish were all dead, and we pondered the effect on our own lungs. When we were on the farm we went organic, I had read more than enough to convince me that herbicides and pesticides, as well as inorganic fertilizers were likely to affect our health. The research into the cancer risk through the use of some agricultural products is now publicly well documented, and by the World Health organisation. Some of our extended family have suffered from agricultural chemical induced cancers. There’s been a whole range of building product disasters from petro-chemically based products to vinyls, to asbestos, cement dust, fiberglass, and chemically treated particle board. Many of those issues now thoroughly researched and most dealt with. And then there’s the whole processed and fast food issue, Supersize Me, Fat, Sick, and Nearly Dead are among the many documentaries on food and how it affects us. The current issue is sugar. And then there’s cleaning and personal care products. So, long story short. We have reduced as much plastic as we can, especially those products that are formed from any vinyl chloride compounds, mainly soft plastics. That’s not as easy as it sounds – tubes, packaging, paints, equipment, cars, clothing, building products – it is everywhere. But we are getting there and with the public and corporate awareness, vinyls are being more responsibly produced and monitored, and vinyl chloride is much more stable today than it was three decades ago. We are using natural fibres, metal drink containers, glass where possible, organic products from foods to personal care products to garden chemicals. Who knows what effect these will have? I’m thinking, they’ve got to be better than vinyl chloride! *Note: PVC is also my initial and in highschool my nickname was plastic! This grumpy horse didn’t have a reservation for lunch, but he tried to stop us going in and tried to bite Geoff (because I pushed the horse out of the way, instant karma), and he seemed to want to come in. The owner, the barmaid went out to sweet talk him (not Geoff, the horse), and by the time we’d finished and headed back out he’d moved down a bit. Apparently he hadn’t been fed and had come looking for a feed. No wonder he was grumpy. On Boxing Day we all went to a well known winery to see if we could get lunch, we didn’t have a reservation, we thought we’d wing it (many other places were closed, so the pressure was on). We arrived and, predictably, the place was packed, and I wasn’t too confident there was a spare table. But the waiter said there was one table for our size group, the last one (Phew! ), and it took my breath away, because the place was busy and there were people still arriving behind us at the door. It was a fabulous lunch and time together. And for me that’s more what life is really like, you can’t always reserve everything, you can’t be certain of everything, or have everything controlled and managed. The point of life for me is in just showing up and seeing what happens, and often there’s a surprise. I have no reservations, but I do have an intention of showing up, and I suppose there will be a few challenges, a few grumpy horses to push aside. This photo (api.ning.com) shows what it looks like early on, this one is laid with bricks flat. People have made them out of metal sheeting, plastic liners, cardboard, etc. In this photo you can see the central compost tower which receives your scraps daily and which feeds the garden daily. The raised bed is moisture retaining and ergonomic in that it is ideal for waist height gardening. It is drought resistant too, and water wise. It is a no dig garden, and permaculture is the theory behind it. It works well by every testimony online, and Jon has said before it has worked well for them. What a great theory!